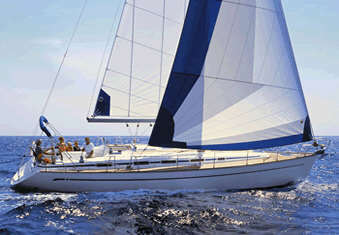 This is a luxury yacht with wonderful sailing performance. She carries a 2.1m inflatable tender and outboard on stern clips. 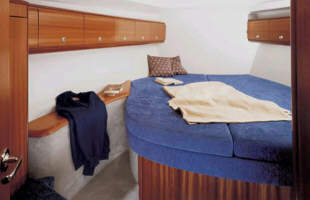 The walk through transom and boarding platform with swimming ladder and shower, bimini and barbeque make cruising easy. 25% DISCOUNT APPLIES TO LAST MINUTE BOOKINGS. 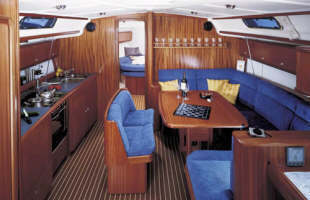 The Bavaria 44 can comfortably sleep 6 in three double cabins. with ensuite shower/toilet forward and shared aft. The forward double cabin has an ensuite head with a hot and cold shower. There is a second head with shower aft, for the two aft double cabins.